The Duck Lake Protected Area is located east of Powell River and provides important nesting habitat for migratory and non-migratory birds. This area offers opportunities for hiking, fishing, swimming and canoeing as well as offering excellent opportunities for birdwatching. 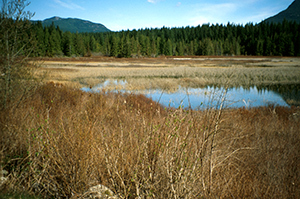 Duck Lake Protected Area is located 5 km east of Powell River, just south of Haslam Lake. There are opportunities for canoeing or kayaking in this park. This is a relatively small lake with a perimeter of approximately 4 km. The Duck Lake Forest Service Road runs along the edge of the lake. Parking is along the road adjacent to the lake. The shore is rocky with steep drop off. e Protected Area has approximately 9 km of good hiking and mountain biking trails which provide excellent wildlife and scenic viewing opportunities. All are well-marked, off of the main Duck Lake Road. For your own safety and the preservation of the park, obey posted signs and keep to designated trails. Shortcutting trails destroys plant life and soil structure. Helmets are mandatory in British Columbia. Swimming is permitted; however, the shoreline is rocky with no sandy beach. There are no lifeguards in provincial parks.